"I am Birdie! The most rotten villain in the world... I hope!." Birdie was a former street thug who learned to be tough while working as a bouncer in seedy British pubs. Birdie had a fondness for leather and chains, and wanted nothing more than to prove his strength to the world. He entered the first World Warrior tournament on the promise of prize money, but was quickly defeated and returned to his backstreet lifestyle. Hearing of an organization called Shadowlaw, Birdie left England again in search of M. Bison, the leader of the organization. Birdie impressed Bison with his tenacity and strength, and Birdie was offered a position in the organization. However, Bison just used Birdie as a source of psycho power, and generally relegated him to menial jobs. His life as a henchman became boring, and he began to realize he was being used, so Birdie decided to leave Shadowlaw. Not content just to leave, he began to gather information in order to bring Bison down. By sheer accident, he uncovered information pertaining to Bison's Psycho Drive, which later found it's way into the hands of Interpol. Birdie returned to the alleys of London, putting his Shadowlaw career behind him. -Birdie is friends with Titanic Tim, the British wrestler from Saturday Night Slam Masters. 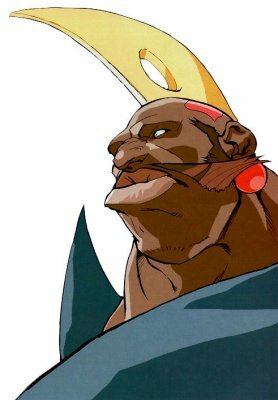 -In his appearance in the first Street Fighter, Birdie was white, but by the Alpha series he was black. Capcom acknowledged this discrepancy during Street Fighter Alpha 3, where one of Birdie's win quotes was "Oh, what!?... Before? I looked pale because I was sick!!"